"A Second Look at Love!" "Tell Me How to Love!" People may have different reasons for getting into blogging. Maybe it's to make connections... maybe it's to make inroads into professional writing... maybe it's even to make money (!). I did not start blogging for any of those reasons. Sad as it may sound, one of my primary goals for getting involved in blogging was I saw it as a way to make... friends. Being a dude in my mid-thirties, it's not too often "in real life" that I come across folks who dig comics as much as I do. All of the anecdotes I share here "above the fold" at the blog, boring as they may be... are even more so to the uninitiated. My offline social circle (as it were) could not care less about what books I found, or what they may potentially mean to me. I feel lucky that in my short time blogging I have met a decent bunch of folks (please check out the great blogs on the sidebar) who share my passion about these silly comic books. I have been afforded the luxury of being able to share ideas while broadening my horizons. Even if it's a comment on a fellow blogger's site (of one of their's on mine) silly tho it may sound, I feel as though I'm part of a community. I'm honestly having more fun doing this than I have any right to. I want to start talking about various bloggers and buddies who've been inspirational to me, helped me on my way, and made this as fun and satisfying an endeavor as it's become for me. Carving out a little while each day to read and write a bit has become something I look forward to. The bloggy-bud that I wanted to mention today is Mike Carlyle from the highly recommended The Crapbox of Son of Cthulhu. Mike reviews books he comes across in the cheap-o bins with regularity, covering all different publishers and various levels of quality. He has a great wit, and provides a ton of insight to what he reviews. The Crapbox is always a good time! Today, I'm gonna crib a page from his playbook (I hope he doesn't mind... and I hope I do it justice) by picking a somewhat-random DC book from my own "crapbox" finds. Today, I present... 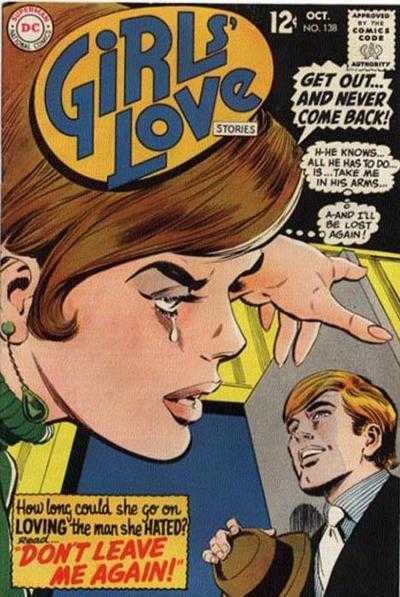 Girls' Love Stories #138 from 1968... I hope we survive the experience. Today's entry features three titanic tales of titillation and trepidation, all having a special moral or takeaway for the impressionable young women of the late 1960's. We open with "A Second Look at Love!" in which our unnamed young lead had been left one year prior by the dashing Bill. Bill, a modern man, just couldn't be tied down to one woman... much less a "square" like our dear brunette. Our lead just couldn't get Bill out of her head... and who could blame her? He is what every man ought to be. In the past year she had dated several potential suitors in hopes that she could get over her lost love. Each relationship was unsuccessful to that end. One day, when it appears all hope is lost she receives a call. Wouldn't you know it... it's Bill! She excitedly prepares to renew her relationship with the "one that (almost) got away", and they plan to meet at a park. She is so attuned to her man that she can point him out by the sound of his footfalls. When he shows himself, our girl is shocked. He just doesn't seem like the same Bill he was before. She is suddenly seeing him differently. It is only now that she knows that in seeing seeing him one more time she was finally able to let go. Our moral here is to "never mourn a lost love". Our second senses-shattering offering is "Tell Me How to Love! ", in which we join Nora a young red-head who so desperately wants to be in love. As she watches her sister Ann break up with her beau Larry, Nora cannot help but be overtaken by emotion. She feels as though she could love Larry, and quickly devises a way to get his attention and help him forget. You know it's love, when you drive in complete silence. Their relationship becomes hot and heavy with the quickness. Why, they walk... they dance... and they partook in silent drives! Nora confides in her sister that she has romantic feelings toward her old flame... Ann, seeing through Nora's poppycock tells her she only thinks she loves Larry, because she feels sorry for him. You get an E for Effort there, Nora. Finally, the day came where Larry and Nora shared their first kiss. Larry took the initiative, and instantly knew Nora just wasn't feeling it. He knew Nora did not love him... she only pitied him. Steve's a regular Doc Savage! At the local pool that summer, Nora met Steve. Steve, a champion swimmer and almost literal "man of bronze" was quite the popular fellow at the pool. While he chose to share his time with Nora, she could not help but feel all the other girls' eyes upon him. They would meet at the community pool daily, and in between bumping into elderly water aerobics partakers and dodging used band-aids, developed something of a relationship. The time came when they too shared a kiss. It was then that our gal realized, it wasn't love she was feeling for Steve... it was admiration, almost a hero worship. Maybe she was a closet Doc Savage fan. Later at a dance, Nora met Nick. Nick and Nora? Hmm... Anyhoo. Nora was wallowing in what has become her trademark self-pity when Nick approaches and asks if he can "have this dance". Nora (almost literally) jumps at the opportunity and we are back in business. The two dated, taking walks, going to the movies... stuff like that. Now it's their turn to share a kiss. This time it's different. While with Larry and Steve, the fellas had to do all the work, this time Nora met her man halfway. She was truly excited to kiss Nick. It was then that she realized... say it with me, she wasn't truly in love. She was only with Nick because she feared dying alone. Okay okay, she just didn't want to be lonely. Can we get a positive ID on this one? Her story closes with several instances wherein she almost bumped into a rather nondescript (and unnamed) gentleman. They saw each other at a concert, at the beach, at the theater, and at the park. C'mon Nora... you don't think there's something a tad suspect about all this? Okay, never mind. It is this man who Nora realizes she loves. This love was organic, and she did not do anything to force it. It was a love surely to last a lifetime... until the police find where he stashed her body a few weeks later. Finally, we are up to our Main Event... "Don't Leave Me Again!" I really do love you Jim... you're like a brother to me! We join Amy and Jim as they take in a football game. All would appear to be well until we learn that these two crazy kids aren't actually a couple. You see, Amy holds a candle for the "great glamour boy" Bruce. Jim does not hide his romantic feelings for Amy, however. She appears to be using him as a fallback when Bruce is unavailable... which is pretty often. Amy keeps our man Jim in the "friend zone". She tells him that he'd made the perfect husband... for some girl, all the while malaising over the fact that she hasn't seen Bruce in well over a month. We observe Amy's endless struggle over her missing beau. She decides that she hates him... which lasts precisely until he calls, one panel later. Bruce makes his triumphant return, and sweeps Ms. Amy off her feet. They share something of a magical week full of visits to the zoo and kisses, apparently. When Bruce disappears on that eighth day, Amy gives her "silver medal" a call and rattles his cage. They go to a movie, and have a heart of heart about Bruce. Amy volunteers that when it comes to Bruce, she has no pride. Yeah, romantic drive-in movie... followed by a cold shower. Just another Friday night for our Jim! One month later, Brucie is back. When Amy questions their relationship he begs off, telling her not to get "so tragic" with him. He begins kissing on her, which makes her lose control. She is once more lost in Bruce City. Once more, Bruce leaves (don't worry, he'll be back). Amy again finds solace in her second prize, Jim. This time, however, she promises that she will tell Bruce that it's over the next time she sees him. Jim is understandably skeptical... however, Amy ensures him that she is sincere. One month later... Guess who's back... Even before Amy can tell him off, he forces one of his magical mystical kisses on her, rendering her his slave-girl. The two decide to head out to a local Discotheque, where Amy "goes through the motions". While there, she observes another couple with a situation that mirrors their own. A woman acting as though she is the property of a man. This is all it takes to shake Amy from Bruce's spell, and she breaks it off once and for all. In the epilogue of our tale, we see Amy and Jim... finally together. I will never again wear ski-pants or tease my hair before hitting the beach! Thank you Mad Mad Modes! Okay, I gotta come clean. This was a lot more fun than I thought it would be. The writing was silly, almost numbingly melodramatic... but, it had charm. The art was surprisingly solid! I enjoyed the visual aesthetics a great deal. The characters were all attractive, and the scenery featured more detail than a lot of books I'd read. When we look at one of these ladies' rooms, it truly feels as though they "live" there. This unfortunately came from an era before creators got their due credit for working in comics. I did some research, and could not narrow down who may have been involved in this books creation. Whoever it/they was, they did a fine job. If anybody has any insight to the identity of the mystery creator(s), please pass that info on. Perfectly fine for what it is, simple stories with morals and far above average art. If you come across any old DC romance books in your friendly neighborhood "crapbox", do yourselves a favor... snap that sucker up and get ready for some sweet silly saccharine tinged with young adult and teen-age (that hyphen is a must) angst! Earn money for that new wardrobe, ladies! Motion Picture AND TV stardom! Do you have 10 people in your life you'd like to alienate? Hey, it worked for me! I think it may be more "love may be waiting just around the corner... with an ether-soaked rag"